In meeting Tim Allen, you find a warm and friendly guy whose love of God and family is evident, but what lies beneath is extraordinary. Tim’s work of creating heart warming family portraits is his dream. In his words, “I love families and it is my highest honor to be entrusted to capture their feelings for each other in a sensitive and artistic portrayal which they will always treasure because it says so much about their relationships and love.” After getting to know Tim, I can tell you that his words are real, and they come from a deep passion within shared by the great artists throughout history. There is a reason that Tim is the premier family photographer in the South. There is a reason that families come from around the country, and even the world, to work with this incredible talent. 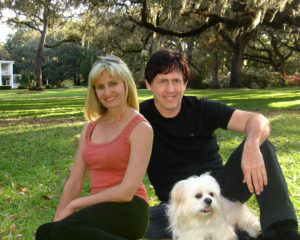 Our primary team consists of me, Tim, and my lovely wife Luda along with our office greeter and dog with a blog, Calla (our special Lhasa Apso). Luda and I as fellow believers share the same vision. Luda works at my side helping to create the incredible portraits we are known for. She provides extra special attention to detail in capturing the intimate warmth of a family. We are extremely dedicated to each family and choose to work with only one per day in striving to create a masterpiece. This is our passion. We care about our clients and take joy in their delight at our sensitive portrayal of their family. Personally, I have always loved and enjoyed photography and remember some of my first experiences in elementary school capturing black and white images of Rock Creek Park where I grew up near Washington DC. I was fascinated with capturing expressions, timeless moments, and scenes of God’s awesome creation especially in our National Parks. On a related note allow me to say what a great country we have to enjoy, thanks to God and our special warriors in the armed services. My Dad served as a Marine, and we owe a sincere debt of gratitude to you all who give so much. My past adventures include flying through the majestic cliffs of Hawaii, Red Square at night, ghost towns of Colorado, lighthouses of Maine, ice caves and Grand Canyon, volcanic pools of Yellowstone, and swimming with the manta rays. The result through the years has been the creation some of the world’s most incredible images and fine art wonders. Today, we continue creating these fantastic images while doing what we love. We are blessed to live on some of the worlds’ most beautiful beaches and the spectacular sunsets are one of our favorite times. We love to ride a boat through the beautiful Gulf with the dolphins, and fishing is always a great time. (By the way, we will be making many of these images available in our fine art gallery for you to own and display in your home and business). Aside from experience, I earned a BFA degree from Florida State University in Fine Arts and Photography. I then declined my acceptance to Pratt Institute of Art in New York choosing instead to pursue my photography career in Los Angeles. 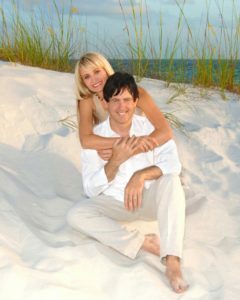 After a short time there, I returned to the beaches I love in Panama City and opened Tim Allen Photography in 1982. In addition to fine portraiture and weddings, our work in fashion and commercial photography has enjoyed world-wide publication with famous clients such as 7Up, Westinghouse, MTV, Sportcraft, Marriot Resorts, and American Greetings. We even won boat photograph of the year for a magazine photo created for Century Boats. Even so, families have my heart. I was blessed with the world’s greatest Mom and Dad who gave us a wonderful family. We suffered the loss of my only brother at the age of 20. God helped us through, and triumph came as I found my passion for creating these family portraits which truly touch your heart. 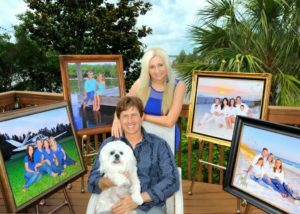 You see, my family had never had such a touching portrait made and that opportunity was lost forever. Without my family I would never have understood sacrificial love, or even be in business today as my Mom and Dad helped me so much. I only wish I could have my precious family captured in time in a portrait like what we create today. I would so love to gaze into our faces and feel the warmth, love and memories we once all shared together. This feeling, that portrait, would be priceless. Along with families, we enjoy working with our high school seniors as this is such an important portrait and time in their lives. My past work in fashion is a great help as we explore spontaneous and natural moments and expression. This influence also spills into capturing the joy and wonder of a wedding day. The touching moments and excitement of this magical day is like none other and we are always honored to be a part of this most wonderful day in their lives. a pleasure to be a part of their world as I seek to capture their lives and experiences. In addition to numerous photography and business awards and honors including a fine art exhibit of his work in light and shadow fashion, Tim’s past includes honor student, representative of Washington DC at the American Legion Boys State, an appointment to West Point by the governor of Maryland, FSU circus performer, and international distributor of the year with a business. He was published in Success magazine twice and recognized for outstanding business leadership. We are currently an accredited member of the Better Business Bureau, the Bay County Chamber of Commerce, and Panama City Beaches’ Chamber of Commerce. Our professional affiliations and memberships have included ASMP and APA. Local awards include the Best of Bay, The Best Places & Faces of the Emerald Coast, repeat Winner of the Bay List, and the Best of Show and multiple placements in Faces & Facets Fine Art Competition.